K9 Advantix ® II is a once-a-month topical application for dogs and puppies that REPELS and kills ticks, fleas, and mosquitoes. 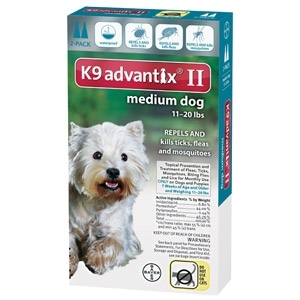 K9 Advantix II contains imidacloprid, permethrin and pyriproxyfen that work in concert to REPEL and kill parasites that can potentially transmit disease-causing organisms. K9 Advantix II is for use on dogs only.